The Amazon Spheres are seen from 6th Avenue at Amazon's Seattle headquarters in Seattle, Washington, Jan. 29, 2018. 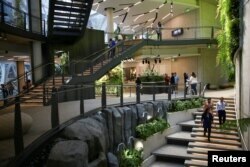 Amazon.com on Monday opened a rainforest-like office space in Seattle that it hopes will spark new ideas for employees. While cities across North America are seeking to host Seattle-based Amazon's second headquarters, the world's largest online retailer is still expanding its main campus. Company office towers and high-end eateries have taken the place of warehouses and parking lots in Seattle's South Lake Union district. The Spheres complex, officially open to workers Tuesday, is the pinnacle of a decade of development here. The Spheres' three glass domes house some 40,000 plants of 400 species. Amazon, famous for its demanding work culture, hopes the Spheres' lush environs will let employees reflect and have chance encounters, spawning new products or plans. People tour the new Amazon Spheres, as seen from the main floor, during a grand opening event at Amazon's Seattle headquarters in Seattle, Washington, Jan. 29, 2018. The space is more like a greenhouse than a typical office. Instead of enclosed conference rooms or desks, there are walkways and unconventional meeting spaces with chairs. Jeff Bezos, Amazon's billionaire founder, officially opened the project in a ceremony with Amazon executives, elected officials and members of the media — by voice command. "Alexa, open the Spheres," Bezos said, as a circle in the Spheres' ceiling turned blue just like Amazon's speech-controlled devices, whose voice assistant is named Alexa. 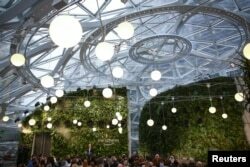 The second and third floors of the new Amazon Spheres are seen during a grand opening event at Amazon's Seattle headquarters in Seattle, Washington, Jan. 29, 2018. Amazon has invested $3.7 billion on buildings and infrastructure in Seattle from 2010 to summer 2017, a figure that has public officials competing for its "HQ2" salivating. Amazon has said it expects to invest more than $5 billion in construction of HQ2 and to create as many as 50,000 jobs. "We wanted to create something really special, something iconic for our campus and for the city of Seattle," said John Schoettler, Amazon's vice president of global real estate and facilities. Amazon founder and CEO Jeff Bezos opens the Amazon Spheres by asking Alexa during an opening event at Amazon's Seattle headquarters in Seattle, Washington, Jan. 29, 2018. The Spheres are made up of 2,643 glass panels. Earlier this month, the online retailer narrowed 238 applications for its second headquarters to 20. The finalists, from Boston and New York to Austin, Texas, largely fit the bill of being big metropolises that can attract highly educated tech talent. Amazon started the frenzied HQ2 contest last summer and plans to pick a winner later this year. At the Spheres' opening, Governor Jay Inslee said the project now ranked along with Seattle's Space Needle as icons of Washington State. 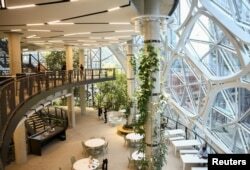 The Spheres, designed by architecture firm NBBJ, will become part of Amazon's guided campus tours. Members of the public can also visit an exhibit at the Spheres by appointment starting Tuesday.